Here are more photos requested by a gentleman who is indeed making one of these! I look forward to seeing the completed plane. I've tried to angle the pieces flat to the camera to eliminate perspective distortion. Bottom view of the depth stop and fence. 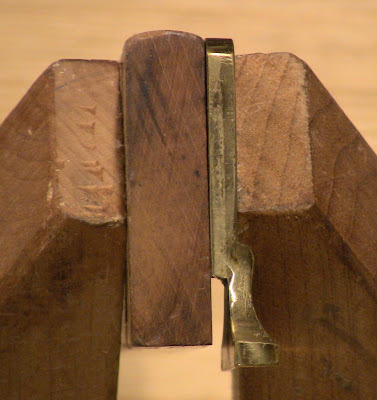 Note the raised section of the depth stop that rides in the adjuster mortise in the body. End cross-section of the fence and side view of the depth stop, angled flat to the camera. The bearing edge of the fence is square to its face, while the back edge is pleasantly rounded. You can see the raised part of the depth stop back clearly, along with the flare of the foot. Bottom view of the depth stop. The raised back section is visible between the clamp jaws. 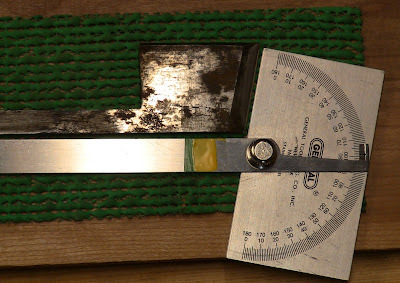 The skew angle of the iron. 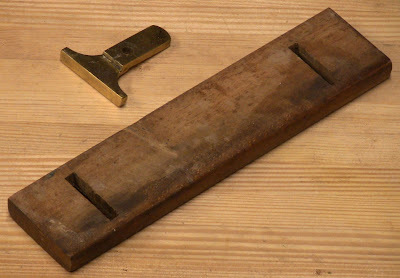 This is just for reference, because the way to grind a skewed iron is to build the plane, then install the unground iron blank and scribe it off the bottom of the plane. Don't measure, use direct marking. That ensures perfect fit to whatever angles the final plane ends up with. 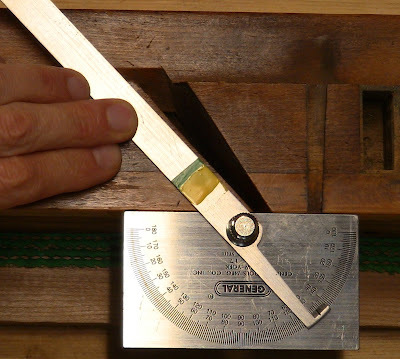 The skew angle at the top of the iron mortise. And exiting at the bed of the plane. Yes, they should match; they just happen to be opposite angles here because of the way I photographed them. 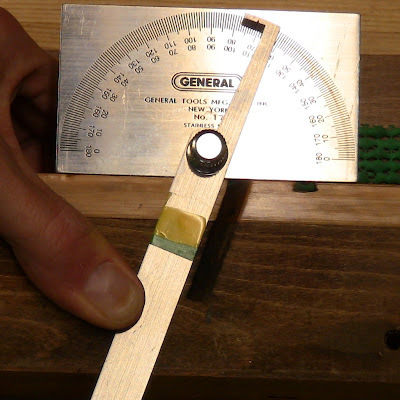 You can see they are numerically the same (within the accuracy of this protractor). 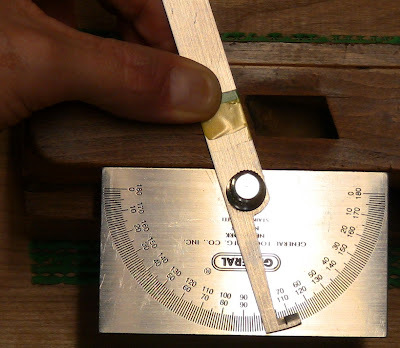 The precise angle you use is not absolutely critical, as long as it's consistent throughout and forms a flat bed to support the iron. Plus or minus a degree from this one is not going to affect it. That's why you save the grinding of the iron for last. The wedge. This is all but impossible to capture with a photo, because it's all compound angles. Like the iron, shape it last, custom fitted and trimmed to the skew and bed angles with the iron in place. 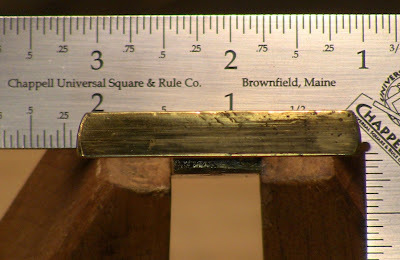 By the way, you can pick up that nice little Chappell square, along with its big brothers for framing, from Maine timber-framer Steve Chappell at Fox Maple. He also has a great book, A Timber Framer's Workshop: Joinery, Design & Construction of Traditional Timber Frames , newly revised. You can see some of his work at the Lie-Nielsen 30th Anniversary Open House.